Facebook and Instagram being down last Wednesday has left some residue on this week’s goals. 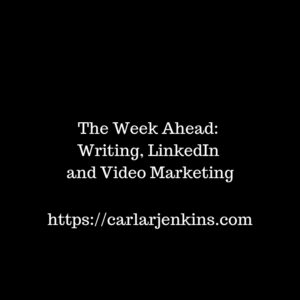 I am now more focused on promoting my email list, online store and being on LinkedIn. Right now I am focused on finishing my IGTV and spring cleaning books and my media kit. I am receiving a lot of attention on Instagram regarding my posts. Also my Alexa Internet global ranking score and Google Analytics are higher than ever. This media kit will prepare me for getting more brand partnerships. I love video because it is the highest converting medium and it allows me to communicate with so many people. I am also happy that my support system shares my videos across their profiles all across LinkedIn, Facebook, Twitter and Instagram. This past week I have had my Certified Scrum Master work series video receive over 100 views because of someone sharing my video!